Three PC welding alums recently came back to visit the welding classroom and meet with current students. Each has a job in a different industry, but all are using the welding expertise they learned in the Peninsula College welding classroom. Marc Bozarth of Sequim graduated from the PC welding program in June 2013 and is now a welding instructor in the Kent training center of the Pacific Northwest Council. “It’s unbelievable the way things worked out,” Marc says. “About two weeks after graduation, I received a phone call from the training and education director for the Council. He asked if I was interested in CWI school, and of course my response was yes. Then, at the end of August, he called again and told me the welding instructor at the Kent training center was retiring and asked if would be interested in the job. Again, my response was yes! “I started as an instructor September 16, and I can't believe how much fun the job is. I am fortunate because the students are either journeyman or apprentices in the millwright, carpenter, pile driver, ship wright, or diver trades. The workweek consists of four ten-hour days, with a three-day weekend, medical coverage, paid holidays, and vacation and sick leave. It was all possible because of the welding program and everything I learned at Peninsula College. Having the AAS degree made the difference. Now, everything I learned is being passed on to those who come through the training center in Kent. If it wasn’t for Peninsula College, I wouldn’t be doing what I’m doing,” Marc declares. A former journeyman millwright and mechanic, Marc had worked in the paper industry for 30 years, first for Nippon and then for Crown Zellerbach in California before transferring to Port Angeles in 1980. He left the company in 1996 for a five-year stint at Carpenter’s International and the opportunity to be an organizing and research coordinator, but opted to come back to Port Angeles and Crown Zellerbach in 2001, finally retiring in 2009. When Marc made the decision to come to PC in 2011, he was 56 and looking to enhance his home shop and welding skills, but those plans soon changed as he got hooked on the program and the quality of the instructors, Eoin Doherty and Jeramie O’Dell. Within just a few weeks, he decided to pursue his AAS degree and get as many certifications as he could during the two-year program. He knew anything he could add to his arsenal would make him more marketable. “Peninsula College has a fantastic program, with a lot of opportunity. Take advantage of it, of the time you have, of the resources that are available and the instructors―they’ll really work for you,” Marc tells current students. Marc also wants the welding students to remember that welding is a skill, not a trade. “The more you know, the better you are, and the more you’ll work,” he stresses. He speaks from experience. He’s now 58 and having the time of his life in a new profession. Gender is also not a barrier―Marc knows several women welders, and the instructor he replaced was a woman, who retired. Rick Rivett has graduated from Peninsula College twice―first in 1987 with an AA degree in management, and again in 2010 with an AAS in Welding. Even though it was 23 years between the two degrees, Rick is glad he has them both. 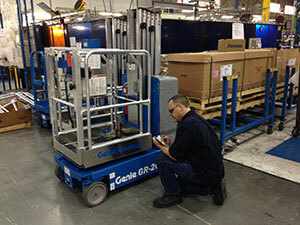 The job he now holds blends his two degrees perfectly―he is a lead for Genie Industries, Inc. in Redmond, WA, part of the Terex Corporation, which manufactures work lifts and platforms as well as man-lifts, stick booms, articulated booms, light towers, and telehandlers. Although he doesn’t weld anymore, Rick knows it was his welding degree that let him get a foot in Genie’s door in 2010, and he wants to let current and prospective students know that a welding degree is worth the time and effort it takes, no matter what point you are at in life. “I want to give people hope that there are jobs out there,” he says. “Jobs with opportunities.” He should know. He is now making more than double what he did before he earned his welding degree, and he’s looking at other ways he can advance even further with Genie. When Rick enrolled in the Peninsula College Welding Program in 2008, he was looking for a fresh start and a new opportunity. After a career out of the area that included several years in the printing industry, Rick moved back to Port Angeles in 2005 and began working for K-Ply. “I stayed to the bitter end,” he says. Out of work and with no other job to be found, he decided to return to school with the help of the Trade Readjustment Act, which provided funding. 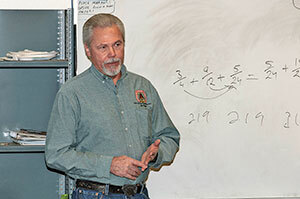 Rick has some advice for welding students and others who are interested in getting a welding degree: Practice. Practice. Practice. He admits that at first he didn’t find the welding booth to be much fun, but he took his own advice and stayed the course, putting both himself and the program to the test. It didn’t take long for Greg Welever to realize the value of getting a welding degree―he was offered a position at Greenbrier Rail Services in Centralia in May 2013, a month before he graduated from Peninsula College with his AAS degree. Greenbrier specializes in work on a wide variety of cars, including covered hoppers, open-top hoppers, boxcars, gondolas, double-stack cars, automotive racks, tank cars and all types of flatcars. With instructors like this, it’s easy to see why so many are attracted to the Peninsula College Welding Program, and why many students come from outside the area just to enroll. That’s what Greg did. It was a good choice. Greg quickly discovered how much he liked the program. “I pretty much fell in love with welding as soon as I lit up the torch,” he says.